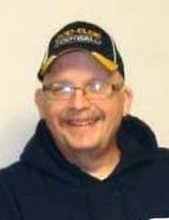 Age 60 of Corunna, passed away Sunday January 20, 2019 at his home. On May 10 1958, Dave Courtnay came into this world and since then it has never been the same. Raised in Lake Odessa, parents Stanley and Violet (Vyverberg) and his older brother Chuck had no idea what they were in for. In High School Dave was a force to be reckoned with. In between managing the basketball team, collecting bowling trophies and breaking records on the golf course, he still made time to get into plenty of trouble with his cousin Rookie (Bret Lee). It wasn’t long before Dave decided to settle down and start a family. Dave was a happily married man, for a little while, each time. There was nothing in his life that made him prouder than his kids. Dave drove truck for various different companies over the course of three decades logging over one million miles, accident free. He was by and far the best driver he knew. Throughout Daves life there was never a time when he wasn’t heavily involved in the Church. You could find him at Street Light ministries lending his time to the homeless. Or at Church of the Living Word leading the Youth Group where the kids affectionately referred to him as ‘Big Dave’. He had an undeniable light that was constantly shining. Dave was an active member of Resurrection Life church when he lived in Grand Rapids and later in life he enjoyed the fellowship of Life in Christ in Owosso. Despite having many challenges and health complications, Dave maintained an amazing attitude and didn’t seem phased by his obstacles. He had the spirit of life inside of him, and a laugh that would fill the room. On Sunday, January 20th Dave passed unexpectedly. He went to be with his Lord. He was 60 years old. Predeceased by his parents and grand dogs Angel and Marley. Survived by his brother Chuck(Jane) Courtnay, children Kristyn(Tony) Courtnay, Josh Courtnay, Chase Courtnay, Aiden(Kysondra) Courtnay, Jeanelle Courtnay, several nieces and nephews and his grand dog Cocoa. A Celebration of Life will be held 12:00 pm on Saturday, Feb. 2nd at Life in Christ church in Owosso. Despite having a bit of a sweet tooth, Dave never sugar coated anything. And if you weren’t sure how he felt about something all you had to do was wait and he’d be sure to tell you. To send flowers or a remembrance gift to the family of David Courtnay, please visit our Tribute Store. "Email Address" would like to share the life celebration of David Courtnay. Click on the "link" to go to share a favorite memory or leave a condolence message for the family.